The Donut Peach, also named Peento, Chinese Flat, or Saucer Peach is deservingly regaining popularity. This white-fleshed variety, originally from China, was popular for some years directly after W.W.II. As many new varieties of yellow fleshed peach gained popularity this excellent variety was nearly forgotten. The Donut Peach is much flatter in height than traditional peaches, with a slight center depression top and bottom. It has yellow skin that is slightly blushed with red. This juicy peach has a superb flavor that is very low in acid and very high in soluble solids, with a hint of almonds and a sweet finish. This firm fleshed, freestone peach is self fertile and bears from mid- June to mid-July. A lowchill variety proven in Southern California, it is best when ripened on the tree. 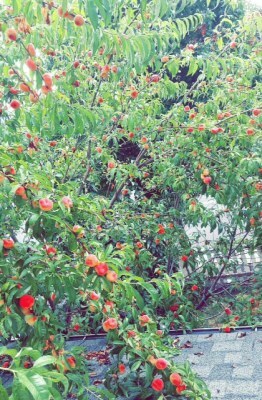 A store bought Donut Peach has maybe one tenth the flavor and texture of the tree ripened fruit. Donut Peaches are excellent for baking, glazing, sautéing in butter and brown sugar, but best of all eaten out of hand.